I am Mandy from Sugar Bee Craft Edition and I am way excited to be here with Elizabeth on twelve crafts till Christmas - all year long I'm in gift buying/making mode, aren't you (well, that and I find a ton of great ideas right at the last minute and want to make them all on an unmanageable timeline....). Stuff your stockings with glass tile pendants. But wait - there's more!! I'm giving away a glass tile pendant necklace to one lucky winner! To enter, just leave a comment - easy, right? You get your choice of either the green tile or the blue tile (sorry that blue one didn't picture well - trust me, it's cute) - both are hanging on the chain just to show off the tiles. Wow! 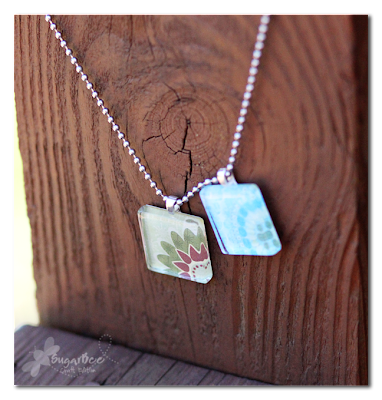 I love these tile pendant necklaces. I would love to find one in my stocking . . . hint, hint to any family members reading this. You might get to put one of these in the stocking of someone in your life. Just leave one comment below. (Only followers of twelve crafts and Sugar Bee are eligible to win.) Tell me if you would choose the blue one or the green one. Tell me if what your favorite food is. Tell me who you would give this necklace to. Just tell me something and you are entered to win. oooh fun! I would love the green one. I know I am the first commenter but hey...it's worth a try right? Awesome post. I would love the blue one. :) This is definitely something I'm going to try! My little one actually took a nap today! So, maybe I'll get a cute, free pendant as a celebration gift :-) I'm a new follower of yours (love all the great tutorials on your blog, by the way!! ), so please enter me in this giveaway. Thanks! These are beautiful! I love the blue one too. I love these little pendants. I think they'd make great stocking stuffers. I think I'm just going to stuff my own stocking this year with all the great ideas I've seen. haha. Thanks for the chance Mandy and Elizabeth! Very pretty! Thanks again for another great givaway opportunity. The blue/green flower one is my fav, but honestly they're both really cute. Such a cute idea. Love the blue tile pendant. Would love to make a photo one. Great ideas. I love this idea!! They are both cute but I love the blue one!! I just might keep it for myself! Actually, my mom has been collecting charms since she was little. She now has 2 huge necklaces full...and is always looking for more to add. So, I would stuff her stocking with it. Not to mention that this is the third year my dad has been without a job...and the second Christmas they won't be getting gifts for each other. My siblings and I have been trying to make their Christmas's a little extra special. i would choose the green one!! Thise are so stinking cute, thanks for the ideas! Cool, I want to try. I'm always looking for fun stuff for Christmas. HMMMM, just in time for my birthday!! Really like the green one. I'd give it to my mom. I love to bake, not so much cook. Christmas cookies are the best! This is a great idea for a gift! I'm thinking on my mother and my mother-in law and a picture of their grandaughter! Thank you! I love the green one! I just bought one of the kits for my daughters Daisy group to make. I would probably give it to a close friend of my mothers - my mother recently passed away and this would be a great gift for her friend because she was with my mom every step of the way. My fav food is cheesecake! I would love the blue one! My favorite food is homemade bread (maybe right now, anyway, because it's baking currently). I would give this to my daughter. It would be a great stocking stuffer. I just LOVE these necklaces. What a fun and easy and inexpensive way to accessorize. So, so cute! I would like the blue one. I know I will have to share it with my teenage daughter. She will love it, too! They turned out really cute! Heading over to check out your blog now! Great idea for my christmas gift list! Thanks!! I would love to have the blue tile for myself. I just stumbled upon your blog and LOVE it! My sis in law and I are planning a craft day this week and trolling the web for ideas. I think these necklaces would be fun for us to make for gifts... but I'd love to win the GREEN one!! So fun! hmmm, i have to pick one?? Blue, I suppose! So I just found your blog tonight. I'm really excited about it and am gearing up to read a ton of your back posts. Great stuff!!! Thanks for all your hard work! I think I would choose the green one, but they're both so pretty! I love the blue one...That wouldbe my first choice, but the green one's pretty cute too! I have the perfect oufit to match! I love these! They are both great but I really really love the green one...I hope I win!! It's my first time visiting and I'm already hooked! Great blog! =) I'd pick the green one. all of the designs are awesome! great idea. thanks for the tutorial and idea! i would probably choose the blue/green and want to keep it-but give it to sis or best friend! I love them both. I would love to keep it for myself (sorry the Christmas giving spirit hasn't hit me yet)! I love them both!!!! Gorgeous! I like both tiles - so I guess I could win both?! jk! Love your blog!